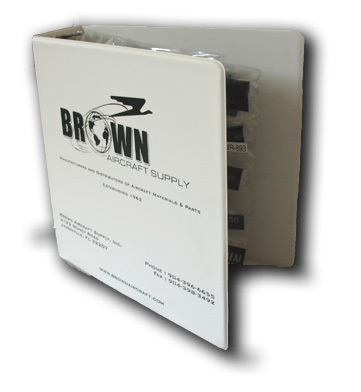 Finding the right seal can be a difficult task � at Brown Aircraft, we try to make things as simple as possible by offering our dealers a sample kit of our rubber airplane seals, so that they can select the right one for their repair project. The BA-100 sample kit has long been a much desired sample catalog for many repair, maintenance and paint shops in the aviation industry. This kit features hundreds of samples of our aviation gaskets and seals, allowing repair professionals to quickly match a nd locate the correct airplane seal for their project. If you are unable to locate the seal needed for your application please contact our sales staff so that we can assist you. We are always looking at new aircraft seals to add to the ever growing Brown Aircraft product line, so if you have a suggestion or custom project please forward it to us at makeasuggestion@brownaircraft.com and we will work with you to deliver the seals you need for your project. The sample kit contains a 2-3 inch sample of approx. 130 different seals that we stock and carry.